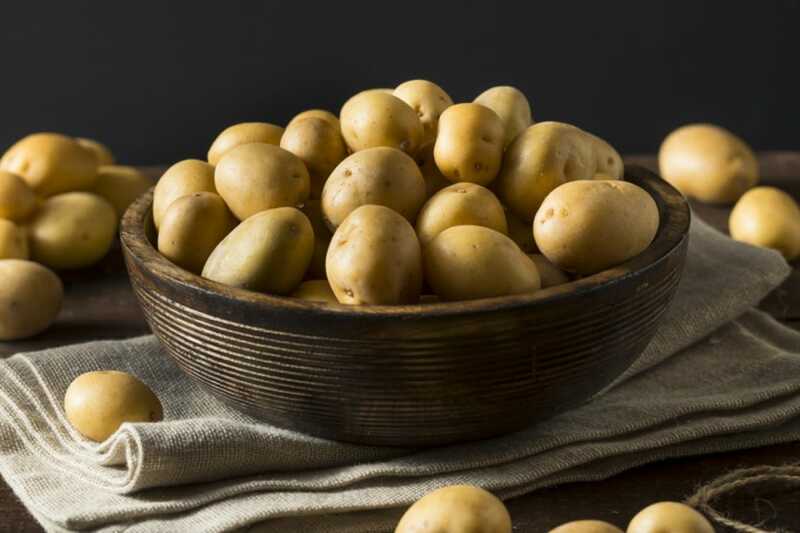 From Yukon golds to fingerlings, find out what different potatoes are best used for. If you've ever had your potato salad have a meltdown at your office potluck or your fries turn hollow when you take them out of the oil, this guide is for you. They're delicious mashed and buttered, deep-fried to a golden crisp or baked and topped with copious amounts of sour cream and chives but not all potatoes are created equal. Some fry better than others, some integrate better with cream and butter and some should simply never be puréed into a soup. 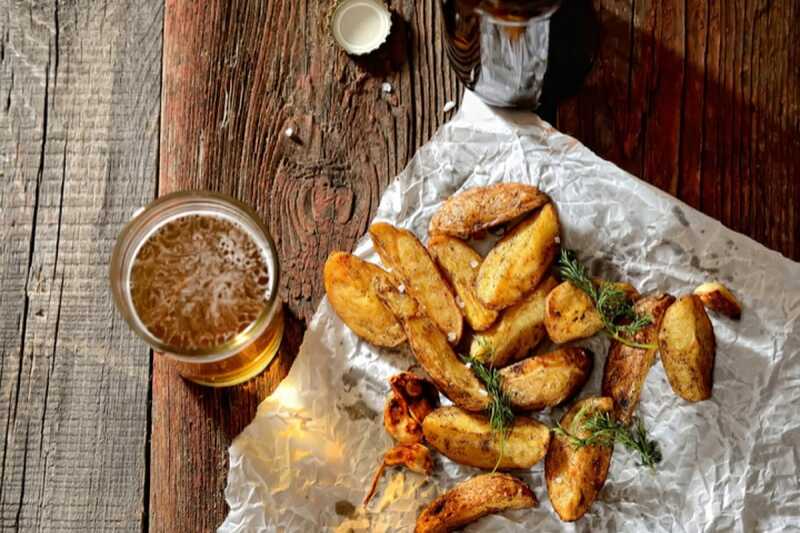 Spuds come in three broad categories: starchy, waxy and an all-star combination of both. Here are six commonly found types and how to best prepare them. Easily identified by its smooth, slightly waxy skin, the Yukon gold or yellow potato is one of the most commonly found spud varieties. It's a pantry staple for its combination of starchy and waxy properties, which allows it to cook well in most recipes. It is a light buttery colour on the inside, and when cooked, flakes easily thanks to its medium starch content. Cook them: In stews and soups for its ability to hold its shape well as well as mashes and rostis. 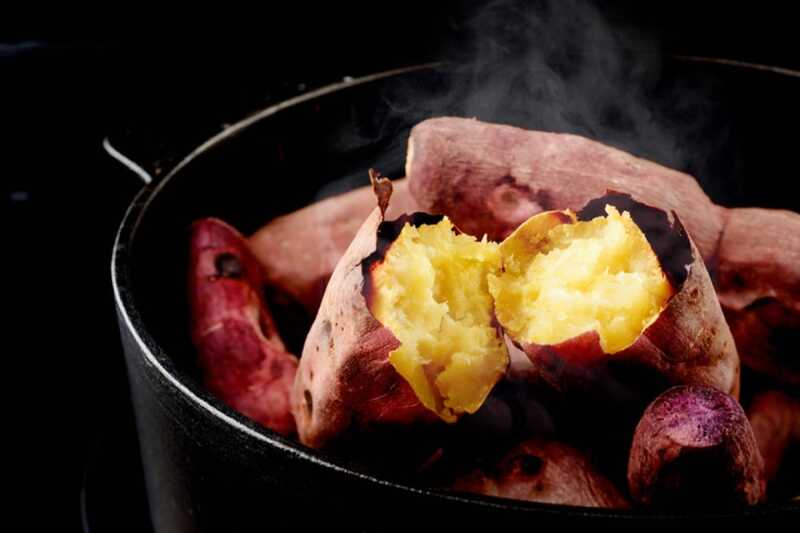 As the name suggests, sweet potatoes are considerably sweeter than other potatoes. They're also larger, heavier, and starchier. There a numerous types of the sweet variant but common supermarket types are the slender-looking Japanese, Garnet, Jewel and the pudgier Covington. The colours of the flesh differ from type to type, ranging from purple to yellow, orange to beige. 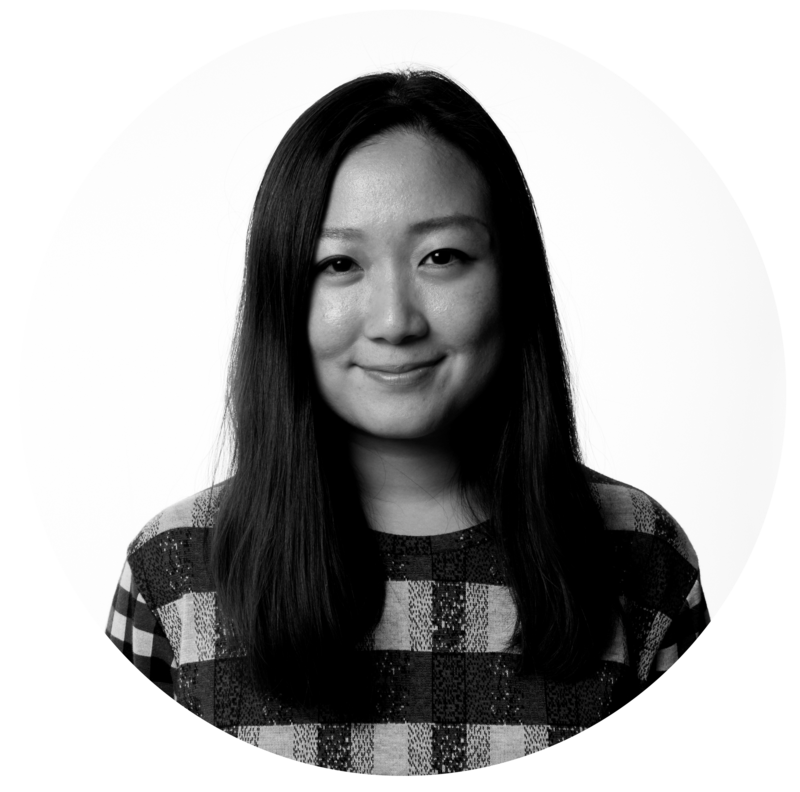 Cook them: By roasting them whole covered in foil and over hot coals – a popular East Asian street snack during cold winter months – to bring out the sweetness. They are also delicious steamed as is, fried into chips and thanks to its starchy nature, be blended into soups, stuffed into casseroles and blitzed up into purées. Also know as Idaho potatoes, Russets largely represent potatoes as we know them: rough-skinned, brown and dimpled. When cooked, it fluffs up beautifully thanks to the high content of starch in its flesh. They're also tremendously absorbent, making them the perfect spud to use for a mash with lots of salted butter and cream. Cook them: They're beautiful when cooked as fondant potatoes, which sees them cut into cylinders, browned in a pan and then continuously basted in butter, garlic, herbs and stock. They also lend well to being fried (french fries), roasted (wedges) and blended into a deliciously creamy potato and leek soup. Just remember to peel them. 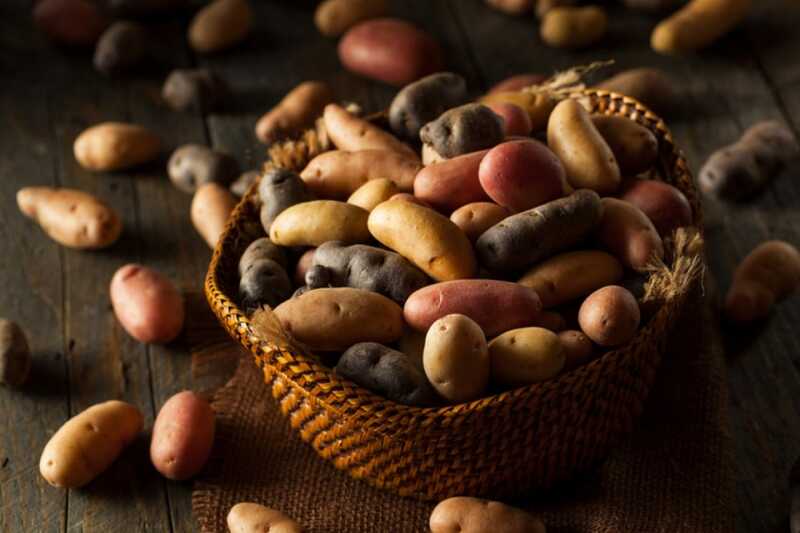 These stubby spuds are often confused with new potatoes, but fingerlings are their own fully grown variety. And just as their name suggests, fingerlings somewhat resemble fingers. Knobby, slim, firm, and short, fingerlings have distinctive flavours, earthy and nutty. The Russian Banana and French are two of more common types found and a quick chop will reveal a waxy yellow flesh. The French, however, can sometimes show a streak of red. Cook them: They're considered waxy potatoes (like your Yukon golds), which means they're great for roasting and boiling. Cut them lengthwise and cook them down with some lemon juice, butter, salt and water until the pan is dry with a glistening layer of butterfat. Also know as the Red Bliss, red potatoes are easily identified by well, their red jackets. Beneath its smooth, red exterior is a waxy, yellow flesh that holds its shape well when cooked. They're one of the more common waxy spud variants found in the supermarket as well as one of the easiest to prepare. Their thin, crisp skins like the fingerlings mean that they don't have to be peeled beforehand. 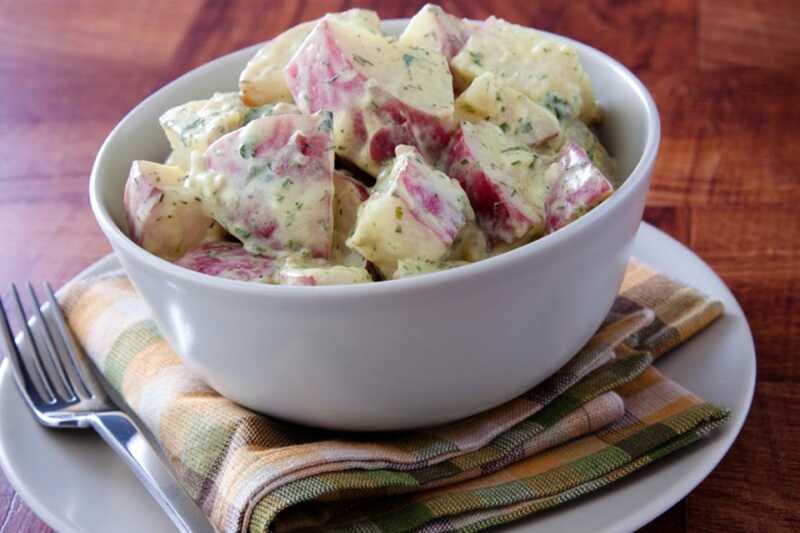 Cook them: We particularly like them in a potato salad because the spuds won't disintegrate into a hot, soupy mess and their little red jackets add a nice pop of colour to the otherwise simple-looking dish. Quickly boil them in water, cut up into chunks and when they've cooled down, douse them in some Dijon mustard and mayonnaise. Then toss chunks with celery seeds and chopped-up flat-leaf parsley, season to taste and serve. 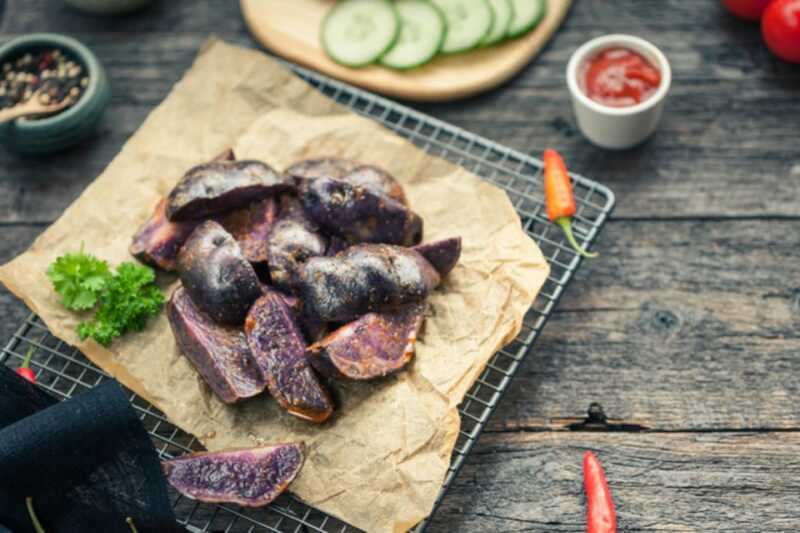 Purple potatoes are naturally purple, with vibrant purple flesh and skin color ranging from lavender to dark blue or nearly black. Some varieties of purple potato include All Blue, Purple Peruvian, Purple Majesty and the Adirondack Blue. Cook them: The dense texture of these spuds mean they mash well and lend well to getting roasted but the sky's really the limit with these brilliant blues. Pair with a bright green Romanesco cauliflower or even ordinary brocolli, an everyday meal becomes a psychedelic culinary experience.